President Barack Obama defended Israel’s airstrikes on the Gaza Strip, but he warned that escalating the offensive with Israeli ground troops could increase the death toll and undermine any hope of a peace process with the Palestinians. “Israel has every right to expect that it does not have missiles fired into its territory,” Barack Obama said at the start of a three-nation tour in Asia. “If that can be accomplished without a ramping up of military activity in Gaza, that’s preferable,” he said. Barack Obama’s comments came as Israel’s campaign against Hamas militants in Gaza blasted into its fifth day. Israel is at a crossroads of whether to launch a ground invasion or pursue Egyptian-led truce efforts, and Barack Obama sought to clearly defend the U.S. ally’s military rights while pushing for a halt in the violence. 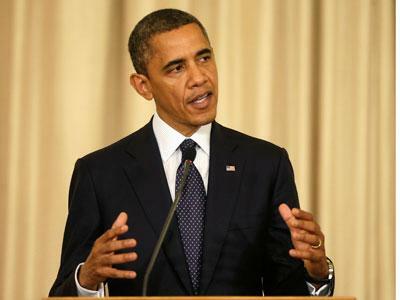 From Thailand, Barack Obama also defended his decision to go to Myanmar, also known as Burma. He will be the first U.S. president to visit the country, which is moving from a brutal reign toward democracy, but still holds political prisoners and is living with ethnic violence. Israeli Prime Minister Benjamin Netanyahu declared Sunday that Israel was prepared to significantly expand its military operation in Gaza. Barack Obama has been lobbying Benjamin Netanyahu along with the leaders of Egypt and Turkey to try to halt the crisis – including stopping rocket strikes on Israel. He said Israel was justly responding to “an ever escalating number of missiles that were landing not just in Israeli territory, but in areas that are populated. And there’s no country on earth that would tolerate missiles raining down on its citizens from outside its borders”. Barack Obama also said Palestinians will have no chance to pursue their own state and a lasting peace with Israel as long as rockets are fired into Israel. He said he hoped for a clearer process over the next 48 hours – showing how much the Mideast conflict had intruded on his diplomatic mission to Asia.